This tablet display is made from stainless steel, with a white powder coat that offers a professional look that matches with any décor with ease. Internal cable management keeps the power cord hidden within for a tidy appearance. This style of tablet bracket with lock is popular in many locations thanks to it's security and stylish look, including retail stores, museums, exhibition halls, and museums. Order today by 2pm EST to receive same day despatch to anywhere in Australia! 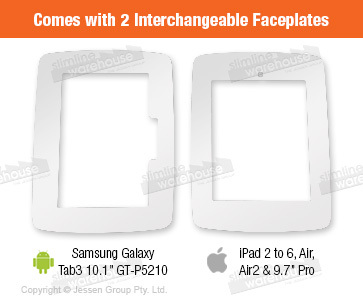 Please Note: This product has been designed to fit Apple iPads® 2, 3, 4, Air, Air2 & Samsung Galaxy Tab3 10.1 "GT-P5210. Although other makes & models of tablets may fit into this unit, there is no guarantee of an accurate fit. Included hardware makes it easy to install onto most wall using only simple tools! This anti-theft tablet bracket, secure wall mount for iPad keeps your display protected whilst in use from theft using a locking front face without a visible lock. A single screw on the back keeps the front face tightly in place. The home button is also covered to keep employees, visitors, and customers from accessing other Apps on the iPad or Samsung Galaxy Tab3 10.1 "GT-P5210 whilst they use it. The case also has a cutout in the face to allow for camera use. 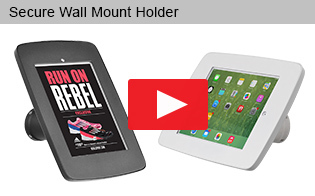 This secure wall mount for iPad includes hardware for easy installation onto most wall surface types. 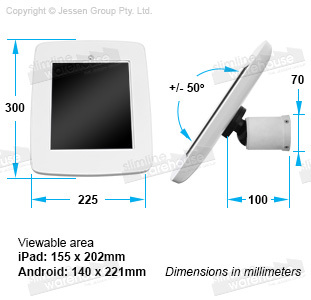 The Apple iPad displays are designed to hold Apple® iPad 2 through Air 2 or Samsung tablet within the holder. The 360° swivel mount makes it easy to switch between landscape and portrait orientation. You can also tilt the screen up or down so that users can have the best angle to suit their height!